My observations, perspectives, opinions on the many places I’ve visited and the people encountered. All dressed up and going nowhere? It’s understandable why Honda is the ubiquitous name for motorcycle. 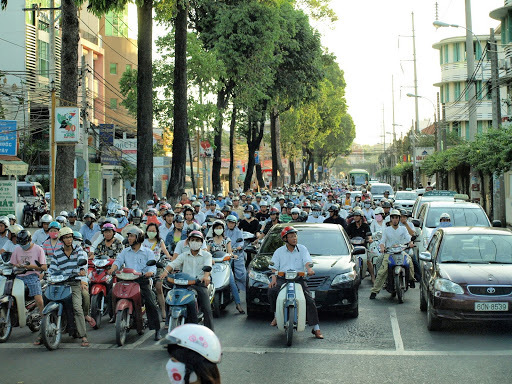 With a population of over 80 million, more than ten percent of the people ride the two-wheel transportation vehicle. 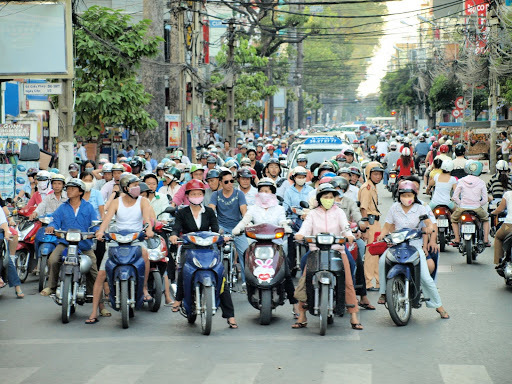 There are 500,000 motorcycles in Hanoi alone, with double in Saigon and motorcycle usage is increasing annually, along with casualties at the rate of 300%. I took these pictures from a bus and we were also going nowhere fast. I didn’t have to worry –we were on vacation. But what about the people who have to work for a living and rely on transportation to get there? Chaos can sometimes result, along with insane driving habits: riding on the wrong side of the road, making left turns from the right side of a lane, weaving, speeding, using high beams, inconsiderate passing and overloading. And the effect is a cacophonous, mind boggling, ear splitting medley of sounds that defy imagination. Only 3% of riders use helmets, even though they are mandatory. Result? The most common accident fatality is due to a broken skull! I was on my way to the Airport to catch my plane, passing through Kitty, a suburb on the east end of Georgetown when my cousin, Rex pulled over to the side of the road. The entire trip had been like that: one long journey punctuated by frequent stops to refill the radiator that was leaking. Rex pulled out the now familiar yellow plastic pail from the trunk and set off to fill it with water, but when I saw him duck into the Offtrack Betting Shop across the street I knew that it would be sometime before I saw him again. As if there is not enough of a problem caused by British Rail on-again, off-again strike that has resulted in an unexpected crush of people in the Victoria terminus in London, I discover that the overnight coach to Penzance is two and a half hours late –something to do with battery trouble I’ve been told. Somewhere deep down in my stomach, I can feel anxiety trying to raise its ugly head. What if, when they eventually get the coach going, it breaks down in the middle of nowhere. What if my contact at the other end did not receive my letter? I seek consolation by telling myself I am not the only one in this predicament and that tomorrow is the start of a weekend, so there’s no need to rush. But first I have to go to the ticketing area, an enclosed room to the left where everyone seems to be heading. As I enter and see the enormous huddle of people, I take a few seconds to decide which queue to join. There are about ten lines, most of them stretched out of the building, losing semblance to a straight line somewhere beyond the rope guide that is about ten feet long. At the back of my mind is a notion of something I have read, about people’s propensity to gravitate towards the right whenever they join a queue. With this in mind, I join the one to the extreme left, the one furthest from the entrance to the terminus and I am pleased with myself, since this seems to be shortest one. Mumbai, India’s largest city, has a population of sixteen million people crowded into a 603 Square Kilometer area, making it the second most densely populated city in the world. Twenty three thousand people occupy a square kilometer. Compare it to Toronto with a population of two and a half million and a density of 793 people! Mumbai, India’s richest city, called the City Of Dreams, also has close to one million homeless people. Thirty-five thousand of these are street children. This little girl in the picture is one of them. I came across her early one morning as we were heading out to the airport and our car was stopped at an intersection. Families have lived for generations on the streets, establishing and colonizing their own section of the pavement where children are born and raised. With just the barest necessities of life most of them know no other existence. Pedophiles prey on the weaker ones and gangsters offer drugs to lure children to a life of begging. For them there is no Slum Dog Millionaire ending! Time and again, I have revisited this picture and can’t help but wonder about the little girl’s circumstances. Is she doomed to the same less than marginal existence that her parents have survived on for years –a life of misery and deprivation? And yet, despite the missing front teeth, the dirty pants and shirt, I marvel at the quiet dignity that seems to pervade her features: She seems to be taking great pleasure from the simple act of washing her face that morning. It was my first trip back to New York after many years. Now I was eager to see the results of the smart revolutionary method the Transit Authority had adopted to overcome the graffiti problem, a method that involved the use of a new material that was both paint proof and washable. Northeast of the city lies Boudanauth Stupa, a UN World Heritage site and one of the holiest places in Katmandu. The stupa’s massive mandala makes it one of the largest spherical structures in Nepal, dominating the skyline. 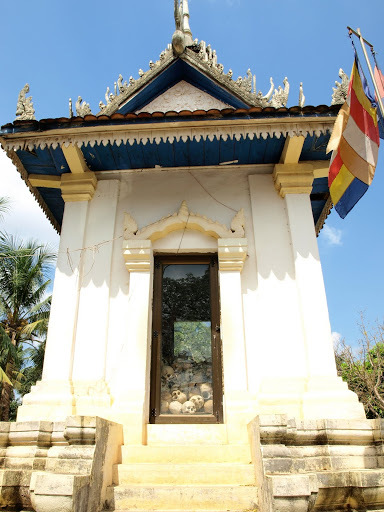 Thousands of tourists of all faith are drawn to it every year, mixing freely with monks dressed in saffron robes. At the top of the dome, wanting to take some pictures of the surroundings, I came across a young monk sitting in an alcove. He was totally engrossed in counting a stack of Nepalese bills, oblivious of everything and everyone else around him, including me. I couldn’t pass up the opportunity: here was a monk, someone who eschewed worldly possessions, counting the day’s take. I clicked before he could see me. However, another monk had come upon the scene and observed what I was doing. He said something in Nepalese to the young monk. The money counter gave me a cross look and wagged his finger. “No permission,” he said. Too late, I thought, the deed is already done. But, I handed over a couple of U.S dollars that he eagerly took with an outstretched hand and added to his stack.